Why are we using unsupported genealogy programs? Comments to my recent post about genealogy software reviews resulted in some further thought-provoking comments centering around the issue of the use of unsupported software. I have just recently completed a volunteer project of moving a substantial amount of data from an old, abandoned and unsupported program to a new genealogy program because the file from the old program was no longer readable. This task involved a third-party and was not my own data. Let's just say I had personal reasons for moving the data that had nothing to do with my being related to any of the people in the file, which I was not. But the exercise of moving the data brought up the constant problem of data migration, that is, moving data from older file formats to newer ones before the old data is lost through obsolescence. In some cases, this comes about as a result of using an older version of a currently supported program, but in many cases, the program is no longer available or may only be available in downloadable "free" versions online. Another concern is the lack of a common transfer method to recapture all of the information in the older program in a usable format. I recently wrote about the online program called GenSoftReviews.com. In a passing remark, I wrote about the fact that many of the programs that were being reviewed are current unavailable or unsupported. We are currently facing another round of major software revisions with new computer processors coming our this year, 2015, and the concomitant upgrades to operating systems that follow. Here is a good outline of the way computer chips are evolving. See "Fifty Years of MicroprocessorTechnology Advancements:1965 to 2015." See also, "Intel’s PC Chief Sees Big Changes Coming in 2015." If people are still rating a program, it is still being used. In the case of Personal Ancestral File, for example, the program is listed as last updated in 2005. It is also important to note that some of these programs receive five star ratings, higher than many of the currently most popular programs. These facts point out the limitations of software reviews, but more importantly indicate that there are still people out there in the genealogical community who are seriously at risk of losing all their data if it is locked up in one of these programs. This list also ignores the fact that even older versions of currently supported programs may have file formats that are unsupported today. For example, if you are using older floppy disk based versions of Personal Ancestral File, these versions are very difficult to recover because the data in in multiple files and may be on more than one floppy disk. The particular program I was facing when I started my current data recovery project which involved re-entering all the data from the original paper documents, involved a "currently supported" program but an older version of the program where the current program could no longer read the data files. This area of concern also includes genealogy programs that were released on one computer format, such as the old Apple version of Personal Ancestral File, and are no longer supported in that version. I listed the unsupported programs above because they had current reviews, but what about all the data on unsupported programs that have no reviews. I am further very aware of this problem because I switched back to using only Apple computers and I have been moving my data to different programs for a long time now. Is there a solution to this problem? There is likely no overall solution and genealogical data will be somewhat constantly lost over time. If you are reading this post, it is likely that you do not have this problem, simply by virtue of the fact that you are online and aware of the problem. But, if you know someone who professes to be interested in genealogy and has their data locked up in some discontinued program, you might try to convince them to move their data to some more supported format as soon as possible, at least, before the next round of new computer processors comes out later this year. After spending a lifetime as a trial attorney, there was and is a fundamental question that I was confronted with from the very beginning of my trial career: how accurate or correct are court decisions? This question goes to the integrity of court system as a whole. In fact, this whole issue revolves around a fundamental, both religious and philosophical question and one posed by the Roman ruler Pilate in the Bible, "What is truth?" See John 18:38. I clearly remember a jury trial I had where after a couple of days of testimony, I realized that the opposing party was lying to the court (Judge and Jury), the opposing attorney was lying and my own client was lying. Unreliable testimony at trial, where either through self-deception or intentional prevarication, witnesses did not tell truth was not all that uncommon. What was also possible, although not as common, was where well-meaning witnesses gave false testimony based on conclusions made from less than all the facts in a case. I was reminded of this quandary when I came across an article on the JSTOR Daily entitled "How to Create False Witnesses." This article pointed out an article from the journal, Law and Human Behavior, Vol. 34, No. 5 (October 2010), pp 418-428 by Jessica K. Swanner and Denise R. Beike, entitled, "Incentives Increase the Rate of False but not True Secondary Confessions from Informants with an Allegiance to a Suspect." The thrust of this study was the conclusion that demonstrably false secondary confessions were a part of 46 percent of wrongful death-row conviction cases. In other words, a significant percentage of death-row inmates were convicted on false testimony. Now, this may or may not be true, but as a long time trial attorney, I can certainly relate to the fact that court decisions are and were often wrongly decided on less than all of the evidence. In one very long trial, lasting more than two weeks, when I questioned the jury, several members of the jury admitted deciding the case simply on the fact that they did not "like" my clients. The jury had decided the case by ignoring the evidence and determining that my clients were less likable than the opposing parties. I could have gotten very cynical about the entire United States legal system, but over the years, I realized that the vast majority of court decisions were what should have happened, regardless of the facts. I used to tell my clients, who would be emotionally hung up on the idea of truth and justice, that there was their truth, the opposing parties' truth and the truth as determined by the judge or jury and in the end, the truth of the case, that is the decision of the court, would become the TRUTH and what they thought may or may not be part of that TRUTH. Notwithstanding this evaluation, after nearly forty years of court cases, I still believe that our system works. I am sure you are asking yourself what this has to do with genealogy? The answer is everything. As genealogists, we delude ourselves into thinking we are always right, when we are sitting as judge and jury over what we consider to be the facts. We are appalled when someone else comes to a different conclusion and rail against their lack of understanding of the TRUTH. After all, we have the facts on our side. We always have "sources" to support our conclusions and the other side's arguments are based on copied family trees and are mistakes or worse. What is even more interesting in the genealogical world is the prevalence of genealogists cloaking themselves in the garb of legality by using legal terms such as proving a fact and weighing the evidence as if these terms will add veracity to their personally ascertained conclusions. My point is this: court decisions are frequently decided incorrectly, why do we then think that our own personal conclusions derived from historical sources are not as equally subject to inaccuracy? How do I know that court decisions are frequently decided incorrectly? The answer is very easily ascertained. Our court system has a method of appealing the decision in any particular case to a higher court. Statistics show that about 40% of the tried cases in the Federal Courts are appealed. That means the parties disagree with the judgment of the lower court to that extent. See "Appealed Rates and Outcomes in Tried and Nontried Cases: Further Exploration the Anti-Plaintiff Appellate Outcomes," from the Journal of Empirical Legal Studies, Volume 1, Issue 3, 659-688, November 2004. There is no reason to believe that the percentages have varied much since this fairly old article was written, although given the topic of this post, you can certainly do so if you wish and comment with more recent data. The exact number quoted in the article is 40.9%. If this percentage of court cases are questioned on appeal, why do we think that our conclusions, based on our own research, are so correct? My position with regard to genealogical, and hence historical conclusions, is that no historically derived "fact" is ever certain. Everything about genealogy is open to revision based on additional data. Even our own personal experiences and memories may be defective. In effect, there are no immutable, unchanging historical facts. Our record of the past is always open to revision. We may assert that a given "document" proves our personal conclusion, but we are always subject to the reliability of the document or source. Can we survive sailing in a sea of uncertainty? Do we prevail by clothing ourselves with mantle of legal jargon? We can and should continue to gather as much as possible from the historical record, but we should always be ready to revise and re-evaluate our conclusions. Even when we attempt to erase this uncertainty by recourse to our system of genealogical judges and juries, the fact remains that the TRUTH of any case or investigation is subjective and subject to revision. One possible definition of historical truth is to define it as the closest possible correspondence to what actually happened. See for reference, "Ways of Seeing History," by Alan Kimball. See also, Ankersmit, F. R. Meaning, Truth, and Reference in Historical Representation. Ithaca: Cornell University Press, 2012. Genealogy is fundamentally an historical endeavor. We cannot remake it into something it is not. For a lot of reasons, we have new phone numbers. 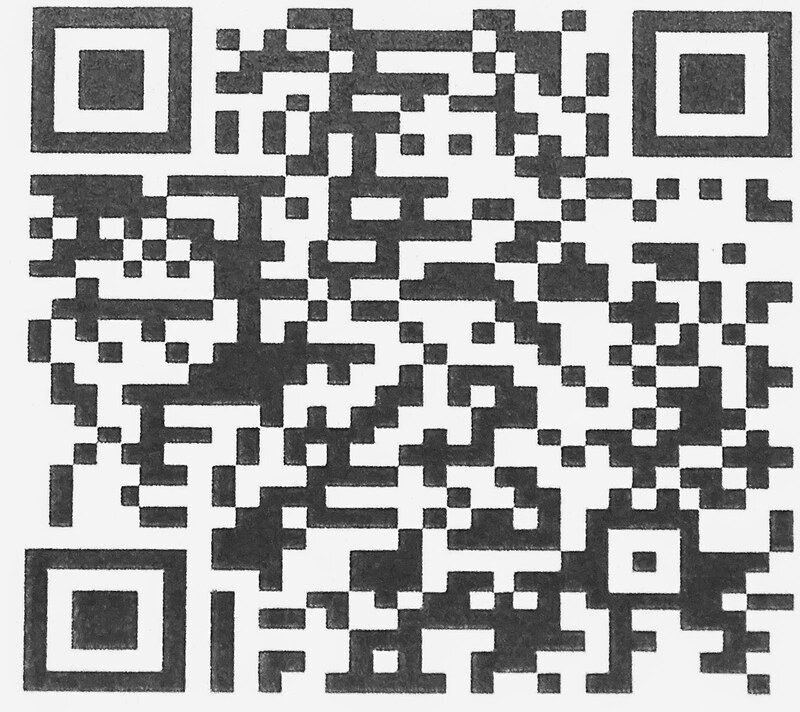 If you need to contact me, please do so by email and request my phone number. My Email is genealogyarizona at gmail dot com. One way to view the popularity of any product is to simply count the number of reviews. Of course, reviews can be both positive and negative. In fact, it is not uncommon to have reviews that wildly praise a program and another, about the same program, that condemn it to oblivion. I have learned to discount very negative reviews especially when there are a much larger number of positive ones and vice versa. But I do have to admit that I will determine my purchases, in many cases, by the reviews the products have received. I am also wary of "friendship" reviews, that is, reviews that come from people who are really trying to promote the products. Also, more detailed reviews carry more weight than short blasts. Most of the software reviews you see are solicited product reviews. In many cases, the reviewer has received some sort of renumeration such as a copy of the free product. This type of review is not necessarily bad, but always needs to be put in perspective. I have avoided doing genealogy product reviews per se, because my viewpoint does not necessarily reflect the "average user" of any product. Doing an adequate formal review of a product is time consuming and never ending due to the constant upgrades and changes in the actively supported programs. Reviews of software inevitably requires a comparison to be valid. It is not enough to say that a certain feature is good or bad if there is no other program that has that particular feature. In my opinion, one of very few (if any) open forum, public review website for genealogy software is GenSoftReviews.com. There are presently 3,025 reviews on the website. The website is maintained by Lois Kessler, who describes himself as a "long time programmer and genealogist, living in Winnipeg, Manitoba, Canada." See About This Site. The opinions in reviews can be brutal and very few products with any number of individual reviews can avoid some very negative ones. The most useless negative reviews are those that simply rant about how bad the program is without explaining why the person bought the program in the first place. Another interesting point about genealogy software reviews; those programs with the highest ratings are not necessarily supported programs. An example from GenSoftReviews.com is the online program Mundia.com which was closed down in September of 2014 and is still getting reviews for some reason. From my standpoint, the fact that I write about a program does not mean I either endorse it or even use it. I try out dozens of new programs every year and write about quite a few, but I try to make my announcements as neutral as possible unless I find the program to be a significant advance or extremely and immediately useful. In going through the reviews on GenSoftReviews.com, I have some of the same questions posed by Louis Kessler in the following two articles from the website, "How Good are GenSoftReviews Ratings?" and Can Genealogy Software be Rated Fairly?" Louis makes an interesting statement in his first article. He says in part, "...the programs that rise to the top of GenSoftReviews in ranking tend to be stable programs with a dedicated user base who like the program, that are less prone to user problems or major failures." You should take the time to read both of these excellent articles. Here is another interesting comment from Louis about the perfidy of software reviewers. So I’ve had to think about what all this means. People don’t believe the ratings on GenSoftReviews either when a program they are using is not rated highly enough, or when another program they do not feel is superior to their own is rated higher than their own. That statement about sums up all software reviews except those that are extremely detailed and lengthy. When all is said and done about software, we all vote with our wallet and our clicks. Programs with few or no users generally get fewer reviews. This is the reason for the title of this post. A program with a very small number of reviews is either very newly released or has no customer base to speak of. If a program had only two reviews and both of the reviewers gave the program 5 stars, it will look great. If the same small number of reviewers both disliked the program then the program looks bad. However, if there are hundreds of reviews it means that the program is currently used by a lot of people and the opinion of any one reviewer is moderated by the large number of reviews. That is why the number of reviews is important and it also helps you to understand why you need to participate and review programs. I do find some really interesting anomalies in the GenSoftReviews.com reviews but any comments I would make will show my own biases and prejudices. One last comment, I am very puzzled by software reviews of programs that are no longer available and no longer supported, especially when they are in the 4 and 5 star range. This shows one reason why genealogy software reviews have some challenges. The Library of Congress is the largest library in the world. It has millions of books, recordings, photographs, maps and manuscripts. I have always viewed the Library of Congress (LOC) as the ultimate library black hole. You can spend a lot of time just browsing what is there. The good news is its size. The bad news is that the LOC, like the United States National Archives, is woefully behind the rest of the world in digitizing and making its collections available to the public. Notwithstanding this lack of digital content, what has been digitized is extensively presented on the Library's website, LOC.gov. 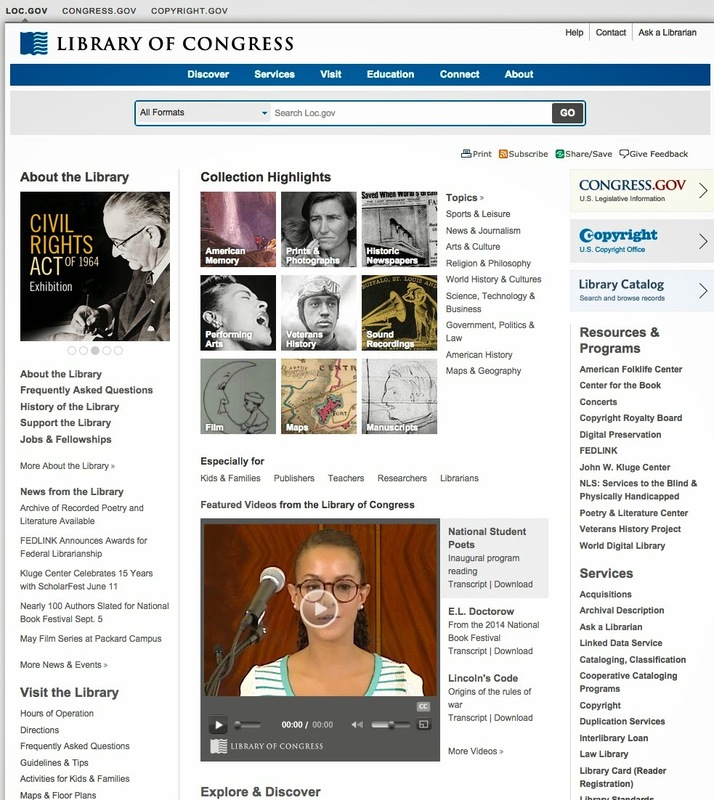 Part of the reason for its lack of attention to making its collections more available to the public comes from the fact that is the Library of the United States Congress. It is not a "public" library in the sense the term is generally used. As such the LOC has the task of providing confidential, objective and authoritative research and analysis to help inform the legislative debate. The LOC also oversees the United States Copyright Office. See About the Library. Unlike many of the genealogically valuable online resources I use frequently, the LOC is not entirely unknown to the average genealogist. If I ask a class about the LOC, there is usually a recognitive response. But if I ask how many use the LOC regularly, there is almost always no response. Why don't genealogists use the resources of the LOC more regularly? I can see several reasons. First, the LOC is mostly invisible to the average online genealogical researcher. I have never seen the LOC.gov website listed as one of the top anything websites from those who make such lists. Whereas some of the websites that frequently make such lists have only a faint shadow of the resources available. Since the LOC is not a public library, as such, it does relatively little to promote its collections. Another reason for the LOC's lack of visibility is its almost impenetrable website. Its website is similar to many of those run by the United States government, they are so filled with information and yet so complicated that the average user cannot seem to ever find what they are seeking even if the user knows it is there. The LOC website ranks right up there with the Social Security Administration, the United States Geological Survey and the National Archives for obscure and almost useless websites. From the standpoint of a relatively unsophisticated computer user, the LOC website is useless. Apparently, there seems to be no way to simply "look for your ancestors." Much of the website is dedicated to talking about a variety of subjects that seem to have nothing to do with finding your ancestors. So why do I think the website is so valuable? Because I use it constantly and because despite all of the appearances I listed above, it has valuable and pertinent information. Here are some of the resources I use most frequently and by the way, if you think the only way to genealogical research is to search for your ancestors' names in some genealogical index, you are woefully in need of some major attitude changes and education. Just to be blunt. Chronicling America is a Website providing access to information about historic newspapers and select digitized newspaper pages, and is produced by the National Digital Newspaper Program (NDNP). NDNP, a partnership between the National Endowment for the Humanities (NEH) and the Library of Congress (LC), is a long-term effort to develop an Internet-based, searchable database of U.S. newspapers with descriptive information and select digitization of historic pages. Supported by NEH, this rich digital resource will be developed and permanently maintained at the Library of Congress. An NEH award program will fund the contribution of content from, eventually, all U.S. states and territories. The Chronicling America section of the LOC currently has over 9 million pages of free, fully digitized and fully searchable newspaper pages as well as the comprehensive list of the location and holding of nearly all of the newspapers published in America since 1690. The LOC has also began putting it holding on Flckr. OK, I am not going to list all of the digital collections on the LOC. You can click here to see the list. Here is the LOC's description of their map collection. You might note that it reinforces what I have previously noted about the digital condition of their collections. The Library of Congress has custody of the largest and most comprehensive cartographic collection in the world with collections numbering over 5.5 million maps, 80,000 atlases, 6,000 reference works, over 500 globes and globe gores, 3,000 raised relief models, and a large number of cartographic materials in other formats, including over 19,000 cds/dvds. The online map collections represents only a small fraction that have been converted to digital form. Notwithstanding the disclaimer, the LOC does have thousands of digitized maps online. Genealogists should be just as interested in preserving what we do have as they are in searching those same records. The LOC is a basic reference source for information about all types of preservation, including digital preservation. The LOC website is the go-to place to find out about current preservation standards and methods. In a rare departure from their overall attitude towards the unsophisticated user, they even address the issue of Family Treasures. From what I have been saying, you may get the impression that the LOC does not have digital collections. That is not exactly true. What I am saying is the only a very small percentage of their overall collections are digitized and made available online. However, what is available is very extensive and includes, historic sound recordings, prints and photographs and website archiving. I think this part of the website, as well as other parts, illustrates why genealogists are not generally aware of what is available or even try to find out. This appears to be general items of historic interest. For some reason, unfathomable to me, genealogists seem oblivious to the fact that what they are doing is historical research. My experience is that the average genealogist has only about as much awareness of history as the general population of the United States which is woefully low. Here is the description of this section of the LOC. The American Folklife Center's Archive was originally founded as the Archive of American Folk Song at the Library in 1928. In 1978 it became part of the American Folklife Center and was subsequently renamed the Archive of Folk Culture. Today the Archive includes over three million photographs, manuscripts, audio recordings, and moving images. It consists of documentation of traditional culture from all around the world including the earliest field recordings made in the 1890s on wax cylinder through recordings made using digital technology. It is America's first national archive of traditional life, and one of the oldest and largest of such repositories in the world. To read more about the history of the Archive read"The Archive of Folk Culture at 75: A National Project with Many Workers,"[PDF, 1.52MB], by James Hardin. Surprisingly, some of this is digitized and online. Last but not least, you need to be aware of the Local History & Genealogy Reading Room. If, by chance, you get an opportunity to actually visit the LOC, you need to be aware of their holdings. They also have a very short list of genealogy websites. Here is a description of what is in the LOC for genealogy. As one of the leading genealogical collections in the country, the Library has more than 50,000 genealogies and 100,000 local histories. The collections are especially strong in North American, British Isles, and German sources. These international strengths are further supported and enriched by the Library's incomparable royalty, nobility, and heraldry collection, making it one of a few libraries in America that offer such collections. Despite its limitations, the LOC is a very, very valuable genealogical resource. The availability of some types of genealogical records, by itself, often dictates where an ancestral investigation begins. Most casual or undirected research focuses on names and dates in the United States Federal Census and other sources that are highly promoted by the online repositories. The problem is that the investigation frequently ends where it begins, with a cursory examination of popular and readily available sources and no real concept of what to do next. From my standpoint, this occurs, in part, because the standard pedigree chart and the common default view of the online family trees emphasize individuals at the expense of family units. In this view, this is the wife's detail page. 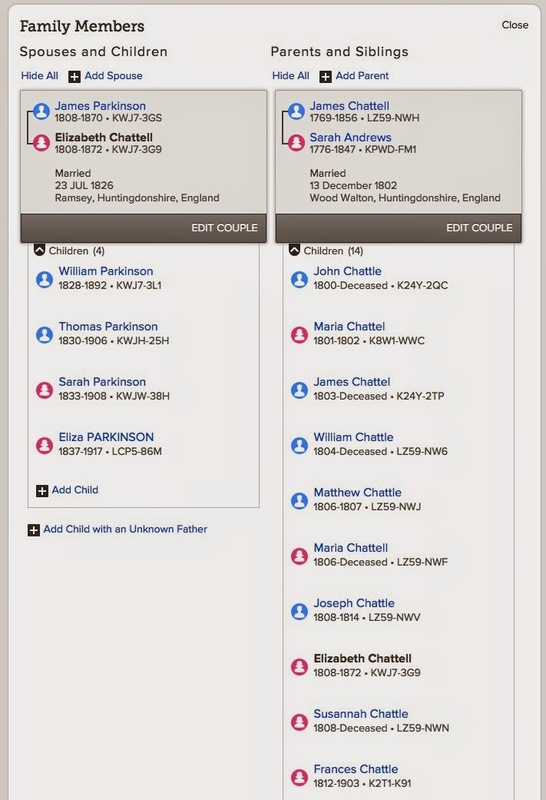 James Parkinson is married to Elizabeth Chattell, shown in the left column and Elizabeth's parents are shown on the right. 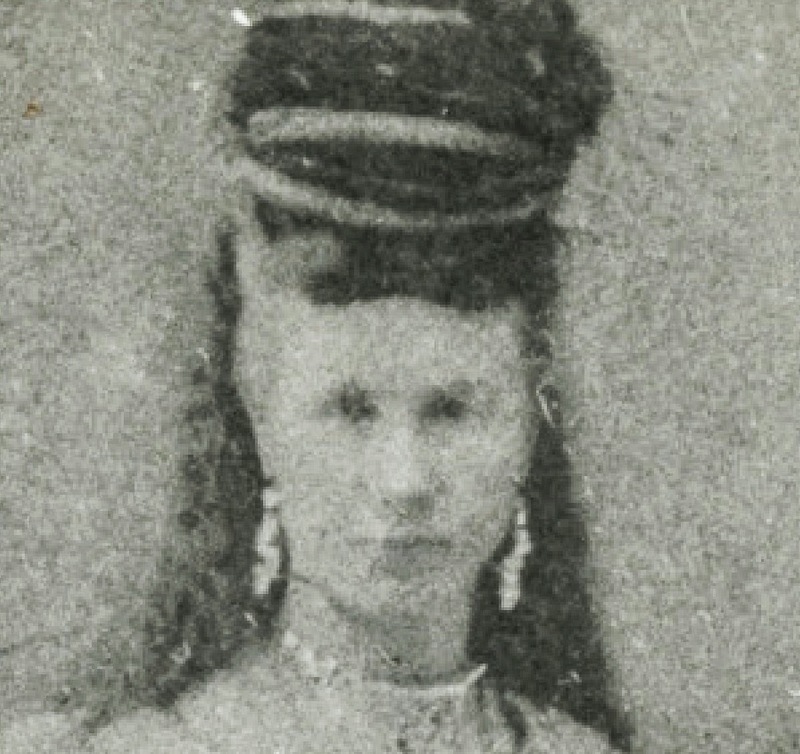 Elizabeth appears as a child in her parents' family with her name bolded. After looking at this type of entry or similar ones from dozens of other programs, the relationships here seem obvious. However, the patron could not figure out why the second, to him, unrelated family on the right had suddenly appeared. He did not see the surname connection between the wife on the left and her father on the right and further, missed that the wife was listed as a child. It actually took me several minutes of explanation before he got the idea of what was being shown. This incident was not unique. It occurs frequently as people view our "standard" forms for representing families. I see the same issues with even more frequency when I try to explain the relationships in FamilySearch.org's Descendancy View. In thinking about this type of situation, I believe that it comes from emphasis on the individual. We look for names and forget family relationships. In fact, the view shown above does more than that. It obscures interfamily relationships and their relationship to additional generations. Genealogy is not a process of filling in so many blanks in a form. If you have ever watched a young child try to do a jigsaw puzzle, you will see what I mean. Until the child reaches a certain point in their development, they will pick up random pieces from the pile and try to fit them into any available space in the puzzle. In other words, they do not grasp the overall picture of the puzzle and the fail to see the relationship between adding the pieces and completing the picture. This is exactly the problem experienced by the patron yesterday. He failed to see the pictured formed by the members of the families shown and was trying to fit in random pieces. This happens all too frequently with online family trees. Yesterday, I also found one of my direct line ancestors on the FamilySearch.org Family Tree had acquired three new children. This turned out to be exactly the same issue of finding pieces and trying to fit them in without looking at the whole picture. In this case, the three children came from a family with a father who had a name similar to my ancestor and a wife with the same name as my ancestor's wife. Coincidently, both the husband and wife were born in the same places as my ancestors. But the source records and the entries showed that my ancestors had married in Utah and their first child was born in St. George, Washington, Utah. There was a U.S. Census Record for 1880 showing the new family with a one year old baby in St. George. Notwithstanding this record, the children were added to the family showing their birth places in Massachusetts from another 1880 U.S. Census record where the one year old baby did not appear. It took me a few minutes to figure out what was going on, but I soon deleted the relationship of the three extra Massachusetts children. This incident is repeated over and over again in the Family Tree and other programs. It would be easy to become overly frustrated with this jungle of poor choices out there, but the causes of this type of seemingly random behavior is inherent in the structure of the programs and forms we use for recording genealogical information. There is nothing in the Family Tree program, or any other program that I am aware of, that would point out the discrepancy between a young family in St. George, Utah and adding three children born in Massachusetts in the 1880s, at a time when traveling between St. George and anywhere in Massachusetts could take an extraordinary effort. At the time, the only way to get across the 300 miles from St. George to Salt Lake City, Utah and a connection to the railroad was by horse or ox-drawn wagon. But even brushing aside historic transportation issues, the real failure here is looking at names, dates and places without considering the consequences to the family. I only have to go back two more generation on this same Parkinson line to see blatant examples of this problem of focusing on individuals and forgetting the family. Here is another example. Apparently so far, no one has look at this "family." They have focused on putting the pieces without seeing the picture at all. Do you see what I am talking about? Maybe the marriage date is a typographical error, but the fact that it has been entered and no correction made is an indication of this common malady of looking at the whole picture with the level of a young child doing a jigsaw puzzle. As the tools for analyzing the Family Tree have become more sophisticated, this type of problem is being demonstrated with more frequency. In this case the date is a typo and it took me only few seconds to correct. Now are we acting like children trying to force the wrong piece into the puzzle? As genealogists, if we think of oral history, we think of recording the life story of a relative. But actually, oral history has many facets and covers the spectrum from commercial interviews such as sports figures and politicians to academic investigations supporting a historical treatise about a specific event. My early exposure to all of these aspects of creating an audio record came from taking classes involving field techniques in linguistics. As a result, I acquired a Sony reel to reel tape recorder and started making recordings. Unfortunately, military service and other obligations intervened and I only made a very few recordings over the years. Although making an audio recording of a relative may seem as simple as turning on a recorder and listening, there are some basic considerations that must be observed in order to have a usable product. I've recently been involved in producing a series of oral interviews of older, mostly retired professors from Brigham Young University. Just recently, I was asked to teach a class on oral history at a local conference. As a result of the invitation to teach a class, I did some more in-depth review of the online resources available. What I found was very interesting. Most of the online resources were directed at oral interviews in conjunction with academic research and what was suggested was distinctively overkill for genealogists. Of course, if the genealogist is seriously considering a formal publication and using the audio interview as a source, the preparation and structure of the interview would be significantly different than a more informal, family history record. I concluded that as a genealogist, I was probably more interested in the stories than the facts of any particular event. I also concluded that I would rely on research and other sources for specific facts about events about a person's life. I found that nearly all of the resources I consulted online about oral histories were woefully out of date with regard to any references to the recording equipment used. I even found references to maintaining tape recorders. For some time now, I have been using a pocket-sized digital recording device. My current recorder is a small Sony digital recorder that provides superior reproduction quality to the tape recorder I used years ago. I did purchase an inexpensive microphone to add some flexibility to using the recorder. In addition, the files produced are directly downloadable to my computer as MP3 files. My use of the pocket sized digital recorder is a far cry from a formal audio studio approach to recording, but the audio product I capture has good quality and is far easier to accommodate than trying to get the participants into a formal recording studio. I am very impressed with the Story Corps approach to stories, but the logistics of getting a person to a recording booth may outweigh any small advantage of the recording booth method of story preservation. You can certainly make a valuable oral history recording with a smart phone. But I would suggest that the battery life and quality would be better with a dedicated recorder. But if it means getting an interview or missing the interview, use whatever is available. Before conducting any oral interview it is absolutely necessary to determine how the recordings are going to be preserved. My current series of interviews are going to be archived in the L. Tom Perry Special Collections Library at Brigham Young University. However, a less formal genealogically related oral interview would necessarily have to be preserved by the family. There are many online sources for storing audio files and making them available to family members, but ultimately, it is important to treat the audio files just as you would any other computer file and migrate the format and maintain the file in a way that it can be preserved for the family. Because my current series of interviews is being archived in a library, necessarily, I need a formal release from each of the participants. I am not a huge fan of making recordings, even of relatives, without their knowledge and or their consent. By maintaining a slightly more formal setting, I can avoid embarrassing or undesirable content. With some exceptions, the best place to conduct the interview is where the person being interviewed is most comfortable, usually in their own home. It is helpful to have quiet surroundings, but with the new technology this is not absolutely necessary. Almost uniformly, online instructions for conducting an oral interview include a list of detailed questions and areas of interest to cover with the interviewee. I have found these questions to be stultifying and counterproductive. My philosophy in making oral history files is to allow the participant to tell the stories. I try to ask as few questions as possible and any questions are phrased as suggested topics. I have found that if I ask a specific question involving a date, an event, or the name of a person, the participant will become uncomfortable and the interview is essentially over. Some genealogist become disturbed because the content of the interview is not strictly accurate. If the genealogist feels the need for historical accuracy, they should transcribe the interview and add interlinear comments or footnotes correcting the information provided. The purpose, as I see it, for conducting such interviews is to solicit family stories and to preserve the voice of the participant. Subsequently, I am not all that concerned with accuracy, I am far more interested in the stories. It is also important not to direct the interview into very personal areas. Let the participant become comfortable with the interview process and then asked general questions allowing the participant to supply the details they feel are important. If possible, conduct the interview in one to two hour segments or even shorter time periods. Do not be concerned that the participant will repeat stories or events. Most of the time, the second or third retelling brings out details omitted in the first account. Here are some online resources I suggest for conducting an oral interview and some resources with all types of audio recordings as examples. Remember, as I said previously, many of the suggestions concerning hardware are out of date. Thanks to John D. Reid of Canada's Anglo-Celtic Connections for the link to this absolutely fascinating video. I just subscribed to their channel also. I am very interested in the modern/historic comparisons. This is a must see video for its historic perspective. After writing my short quasi-satirical piece on the Genealogical Crisis of the Month Club, I found that my example of the crisis concerning governmental restrictions limiting access to information was a real concern. With some small effort, I tracked down a bill before the Parliament of Australia entitled the "Copyright Amendment (Online Infringement) Bill 2015." The online news reports of the effects of this bill are drastic. Here is one such article on the ExtremeTech website, "New Australian bill could outlaw VPNs in bid to stamp our Hulu, Netflix 'piracy'." A "VPN" is a Virtual Private Network or a network that uses a public telecommunication infrastructure, such as the Internet, to provide remote offices or individual users with secure access to their organization's network. See SearchEnterpriseWAN.TechTarget.com. What is happening here is that the TV and movie companies are claiming, without actually proving, that Netflix and Hulu are violating their copyrights. Rather than forcing the companies to prove their claims, the government is contemplating passing a bill to limit online access to the services by giving the companies the right to shut down or limit the Australian public's access to Netflix and Hulu. It may seem a jump from limiting access to some TV shows and movies to limiting genealogists from accessing records about dead people, but it is really all about the same conflicting interests: copyright, privacy and government control. You might not have noticed at all, but there was a recent controversy over the availability of the United States, Social Security Administration's Death Master File and the resulting Social Security Death Index or SSDI. The gist of that ongoing controversy was the fact that the Social Security Numbers of dead people, including dead children, from the SSDI were being used to generate false claims to the Internal Revenue Service. Rather than simply have the Internal Revenue Service check the SSDI or the Death Master File to verify the validity of Social Security Numbers, the United States Congress, after hearing testimony, decided to limit access to the records to everyone. Companies who were putting the SSDI online, such as Ancestry.com and FamilySearch.org were accused of "aiding and abetting the fraud." In other words, those who were simply providing public record information were the "cause" of the people who were illegally using the information. So, just as it apparently happening in Australia, the United States Legislature passed a bill limiting access to the records to the public rather than addressing the root of the problem, the lack of competence of the Internal Revenue System. This was done without one shred of evidence that anyone had actually used either Ancestry.com or FamilySearch.org to defraud the government. See H.R.295 - Protect and Save Act of 2013113th Congress (2013-2014). For a more current summary of this Bill, which was passed on 26 December 2014, see "Last Chance to Comment on Rules Regarding Social Security Death Index Access." The practical effect of the passage of the law is that Social Security Numbers have disappeared from the records supplied by FamilySearch.org etc. in their SSDI listings. Ordering a copy of the person's SSA 711, Application for Social Security became much more difficult and expensive. You may have also heard that the 1890 U.S. Federal Census was lost in a fire. That is true for part of the records, but what happened to most of the records was that they were destroyed by the U.S. Government. See "First in the Path of the Firemen"The Fate of the 1890 Population Census, Part 1 By Kellee Blake. I could go on and on about this subject. There is no question in my mind that the diseases talked about each month in the old Reader's Digest and the current diseases and conditions highlighted in my current AARP Magazine are real, the question, of course, is how do we as individuals react to and confront this ongoing litany of crisis? If I have learned one thing in the last 40 years of being a lawyer is that there is almost always a work around for any disaster: unless you end up dead, you fight back. If you want a place to start for worrying about the loss of genealogically important records, you can start with the destruction of the Library of Alexandria and oh, by the way, you might discover that no one really knows when it happened. See Wikipedia: Destruction of the Library of Alexandria. Genealogy is all too placid. What we really need to liven things up is a Genealogical Crisis-of-the-Month Club! One of my very early, distinct memories is when I was living in a very small town in Eastern Arizona, far away from the civilized world, was of seeing a large airplane fly high above my head and being worried that it would drop an Atom Bomb on me. Notwithstanding the fact that the fear was ungrounded, it was real. When I was a little older, I used to read the Reader's Digest. The one amazing thing about this magazine (don't get me started on Condensed Books) was that every month, month after month, they seemed to come up with a new disease threat. In my impressionable youth, I was constantly worried about symptoms and whether or not I had that Month's malady. As I grew much older, my fears and concerns began to spread to such things as terrorists attacks, environmental collapse and global warming. Now, I have added the burden of a genealogical crisis to the litany of things I have to worry about. Now, let's see. What can I worry about today? Maybe I should start worrying about governments shutting down all the libraries, archives and limiting all the records due to "privacy" concerns. This, of course, will be caused by the "Privacy for the Deceased" Action Committee. After all, we don't have enough to worry about, do we? Is there a better way to document complex familial relationships? I recently got into an exchange with genealogist David McLean. 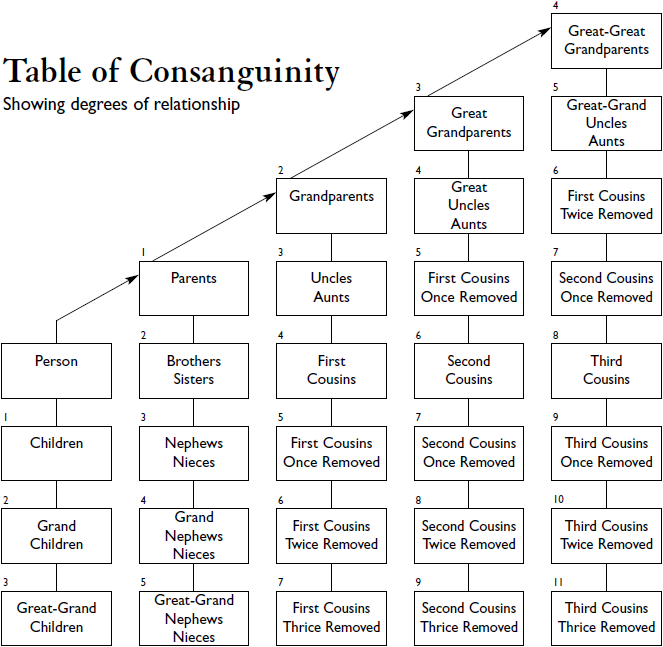 David wrote to me outlining some of his ideas on the need to simplify the concept of relationships usually expressed by this Table of Consanguinity shown above. Personally, I cannot remember a time when I did not understand the idea of cousins once or twice removed. But as I got into teaching genealogy, rather than just doing it, I quickly learned that most people (nearly all?) were mystified by the concept. It is important to understand that this structure is entirely Western European based. The terms used to designate relationships, which may appear to some to be "self-evident" are culturally determined and vary considerably throughout the world. We also get into the illusion of cultural superiority when we think that there is one "right" way of defining a world view. I guess occasionally, we run into a world view that differs from our own and we have wars and strife over the differences. My own ancestral history has some twists and turns that are not well accepted by the mainstream of our European-based culture, at least in the United States. Although even in the mainstream of life in the United States today, issues such as polygamy seem rather "well settled," we actually live in a highly complex relationship structure that doesn't fit well into this Table of Consanguinity. For example, what relationship do I have to my brother's former wife? Since she is no longer an "in law" because there is no legal relationship between her and her former husband, what do I call her? Does the divorce affect my relationship with my nieces and nephews? What do I call the second wife of my uncle? Are her children, not the children of my uncle, my cousins? Are the children of my Great-grandfather's second wife, the one I am not related to by blood, my cousins? How do I explain that one cousin and I share the same Great-grandfather and Great-grandmother, but another cousin shares only my Great-grandfather? Even though we would like to believe that the straight-forward chart above "explains it all," in fact, it is merely an artificial construct that works only within a very narrow and confined context that does not easily make allowances for the great variety of relationships that actually exist in our society. In addition, the chart fails to tell us anything about the real relationships, meaning the socially initiated relationships that exist and are the basis of the practical realities of our lives. For example, I may have almost no contact with or involvement with various family members who are "close" relations and yet have a very close relationship with other family members who are not a closely related. Genealogy has a distinct tendency to paint family relationships, at least in the United States, with a broad, ill-defined brush. As I have written many times in the past, our genealogy programs do a poor job of preserving and documenting these "outside of the box" relationships. Is there a way to cut through this haze of relationships and develop a common terminology? Maybe. I do think that the concerns expressed by David McLean and others are legitimate. But linguistically, I doubt that any contrived set of terms or relationships imposed by genealogists on their databases will have much of an effect on the overall concept of relationship in our country or in any other county. The main thrust of the concerns expressed by David McLean were directed at the results of hearing things such as "a 15th cousin, three generations removed. There is a program, currently popular among some interested in genealogy, called Relative Finder from Brigham Young University (BYU). Here is a screenshot of the startup page. In addition, there are many other programs that purport to reveal how you are related to various famous people, both current celebrities and historic figures. All of these programs have the fatal flaw of assuming that the database used to calculate these extreme relationships are at all accurate. 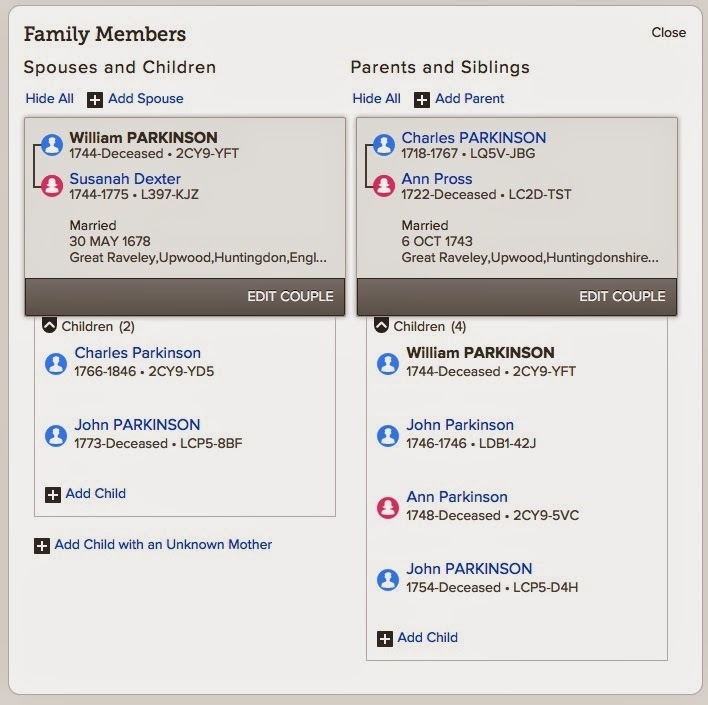 For example, the current local fad to use Relative Finder to establish distant relationships using the FamilySearch.org Family Tree ignores the fact that those relationships are far from settled, documented or even presumably accurate. These facts are ignored with the excuse that these types of programs are a way to get people involved with genealogy. Personally, I am not sure how my interest in genealogy was increased when I disproved a family story that I was related to Daniel Boone, but that is discussion for another post. It is fairly straight forward to visualize that my 1st cousin’s children would be my “1st Cousin 1 Generation Removed” because they have one more “hop” to reach the our common ancestor. Their children likewise would be my “1st Cousin 2 Generations Removed” (one additional hop). But what about relationships the other way? My aunt is nothing more than a “Sibling 1 Generation Removed”. This means she is a sibling to one of my direct ancestors. A “1st Cousin 15 Generations Removed” is nothing more than a 1st cousin to one of my direct line ancestors. In this case my 13th generation grandparent, (i.e. 2 hops to a grandparent, so 15 becomes 13). 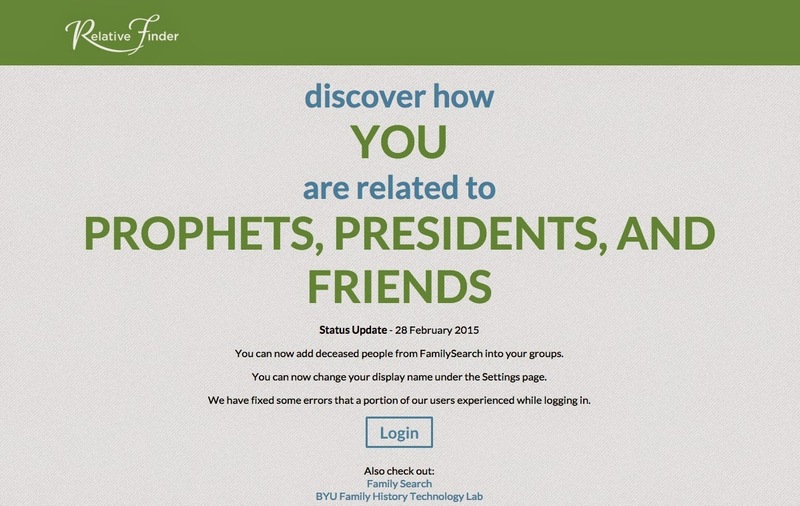 This is especially useful in visualizing relationships from the BYU Relative finder. Say one of my friends is my “12th Cousin 3 Generations Removed”. This means that her 12th grandparent is my 15th grandparents (she has 14 hops to get to the common ancestor. I have 17 hops to the same common ancestor). This just means nothing more than that her ancestors, on average, were just a bit younger than my ancestors when my direct line ancestor was born (I have more hops). There no more mystery! The complexity all comes from our habit in the English language (and many other western languages) of inserting a "great-" before a grandfather, thus making the cousin relationships have an "off by one" problem. It?s hard to remember that if we share a 2nd great-grandfather, we are third cousins. Just don't use the great, he is your 3rd generation grandfather, and we are 3rd cousins. Everyone immediately understands and relationships are so much easier to visualize. The same concept extends to "removed" relationships. The removed refers to the number of generations removed a relationship is. If my 3rd grandfather is your 5th grandfather, we are 3rd cousins (the lower number) 5 minus 3 equals 2 generations removed; if my 8th grandfather is your 9th grandfather, we are 8th cousins 1 generation removed, etc. The complexity comes from our habit of saying "times removed." They are not "times removed" whatever a "time-removed" is. Just say "generations removed" and everyone will immediately understand you and appreciate the clarity. This is certainly an interesting way of explaining a complex system. Thanks to David McLean for the example and suggestion for yet another blog post. 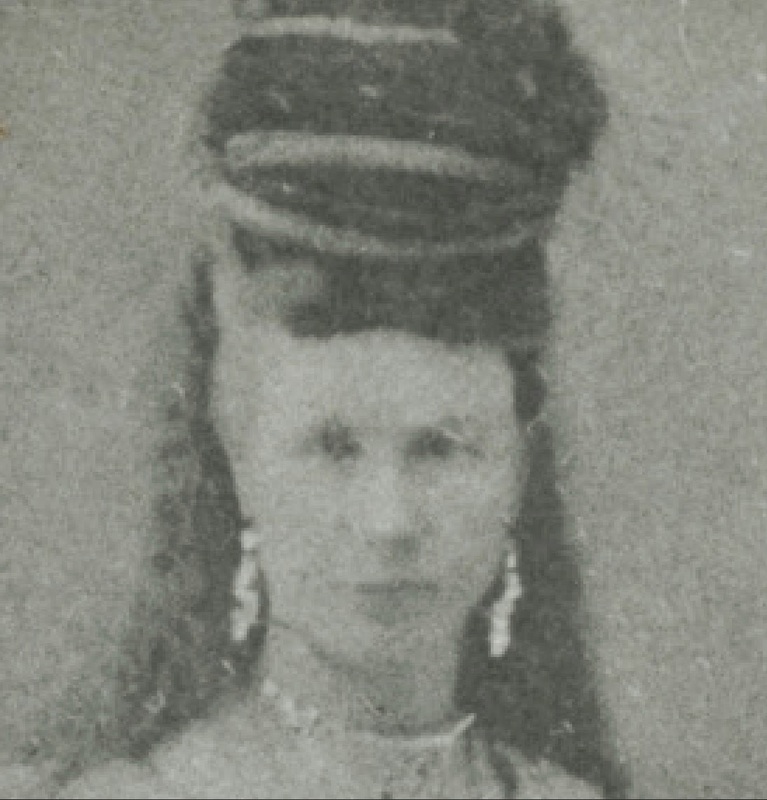 Here is another fabulous story from MyHeritage.com. Here is an excerpt from the notice I received about the story. MyHeritage has been working closely with Emmy Award winning writer, producer and author, Yvette Manessis Corporon. About a year ago Yvette published a book called "When The Cypress Whispers". The book is fictional but some of it is based on true stories she grew up hearing from her grandmother, including the secret of the Greek Island of Erikoussa. When the Nazis invaded Corfu, most of the Jewish citizens were killed, but a tailor by the name of Savas was able to escape with his three daughters, and a girl called Rosa, to the nearby Island of Erikoussa. Savas had customers and acquaintances on the Island, but what was incredible was that the entire Island joined forces - at risk of death - and gave refuge to Savas and his girls, and kept their identity secret from the Nazis, for the duration of the war. Yvette's grandmother was one of those Islanders. She was good friends with one of the girls, and so Yvette turned to MyHeritage to ask if we could help find the family. We did, and an emotional (although virtual) reunion took place between Yvette, and Rosa's sons. This is an unfolding story, there are still puzzle pieces we're putting together, but until then it's great that the heroism of the islanders has come to light, and we were happy to be able to connect two families with a remarkable shared history. In June these families will be reuniting on the Island for the first time since the war. They will be attending a special ceremony in which the Islanders' bravery will be recognized, and an award presented to Erikoussa. Learn at your own pace – Ancestry Academy’s in-depth courses are broken into a series of short lessons that let you learn when you want and how you want. Watch a course all the way through or pick and choose the lessons most interesting to you. Test your know-how – Try out your skills and take optional tests to make sure you’re getting the most out of every course. Learn on-the-go (coming soon!) – Learn at home or on-the-go with the free Ancestry Academy app, available for iOS and Android devices later this spring. New courses added monthly – Continue strengthening your family history expertise with new courses added every month. 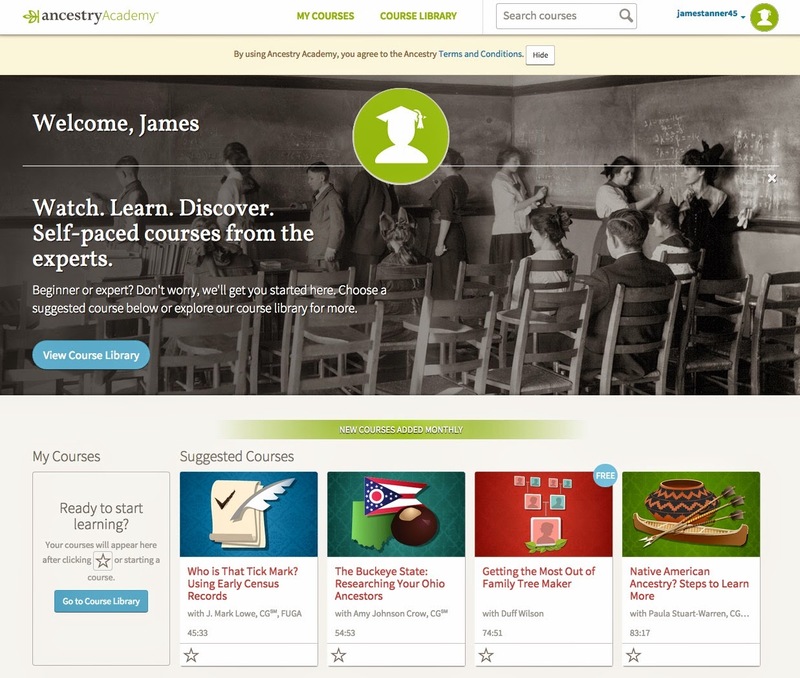 And much more – Ancestry Academy coures are loaded with other helpful tools like closed captions, digital handouts, course placeholders, and more. Click on this link to go directly to the AncestryAcademy. The HathiTrust.org is a partnership of major research institutions and libraries working to ensure that the cultural record is preserved and accessible long into the future. There are more than 100 partners in HathiTrust, and membership is open to institutions worldwide. The website currently hosts more than 13 million total volumes with over 5 million in the public domain. Genealogists will find this a treasure trove of information from surname books to local and state histories. The Digital Public Library of America currently has over 10 million items from libraries, archives, and museums. The DPLA is dedicated to providing this content free to the entire country. Quoting from the blog post entitled, "DPLA and HathiTrust Partnership Supports Open E-Book Programs." The Digital Public Library of America and HathiTrust have had a strong relationship since DPLA’s inception in 2013. As part of our ongoing collaboration to host and make digitized books widely available, we are now working to see how we can provide our services to exciting new initiatives that bring ebooks to everyone. The Humanities Open Book grant program, a joint initiative of the National Endowment for the Humanities and the Andrew W. Mellon Foundation, is exactly the kind of program we wish to support, and we stand ready to do so. Under this funding program, NEH and Mellon will award grants to publishers to identify previously published books and acquire the appropriate rights to produce an open access e-book edition available under a Creative Commons license. Participants in the program must deposit an EPUB version of the book in a trusted preservation service to ensure future access. HathiTrust and DPLA together offer a preservation and access service solution for these re-released titles. Since 2013 public domain and open access titles in HathiTrust have been made available through the Digital Public Library of America. HathiTrust recently added its 5 millionth open e-book volume to its collection, and as a result DPLA now includes over 2.3 million unique e-book titles digitized by HathiTrust’s partner institutions, providing readers with improved ability to find and read these works. Materials added to the HathiTrust collections can be made available to users with print disabilities, and they become part of the corpus of materials available for computational research at the HathiTrust Research Center. By serving as a DPLA content hub, HathiTrust can ensure that open access e-books are immediately discoverable through DPLA. The basic idea here is to make books that would otherwise be unavailable online due to copyright or other issues and make them available to the public through the DPLA and the HathiTrust. To what extent should historical photographs be altered, restored, improved or changed? Do the same rules apply to recently made digital photographs? Why is there or why should there be any difference between the preservation of a digital photo and an older physical one? Let's look at the photo shown above. Here is a magnified view of the face at 400%. As you can see, there is almost no detail in the image despite the fact at lower magnification, there appears to be some detail. You should also notice all the "artifacts" in the image. That is the general term for all the dust, scratches, and defects. What if I increase the contrast and the amount of detail using Adobe Lightroom? Here is the modified version. 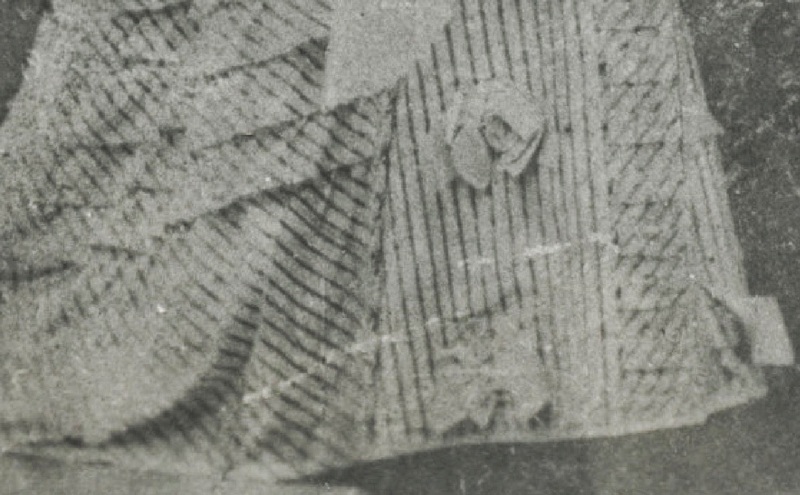 The photo looks like it contains more detail, but the artifacts are also more prominent. This photo demonstrates an important point, you are, in a sense, stuck with the resolution, detail and content of the original. For me, it is a toss up as to whether the unretouched scan or the altered one is the better of the two images. What if I take out all the artifacts? Here is a preliminary attempt. Here is my question. Is the mark on her mouth a defect or a scar? Here is the same image after working on it for a while at 400% magnification. Here is the entire photo again with the alterations. Now, you can compare the image here with the image at the beginning of this article before I made any changes. Can you see what was done to the image? Would it matter to you to know that this person had a prominent scar on her face? Would you post this altered photo without disclosing the original or at least, putting on a notice that the image had been altered from the original? 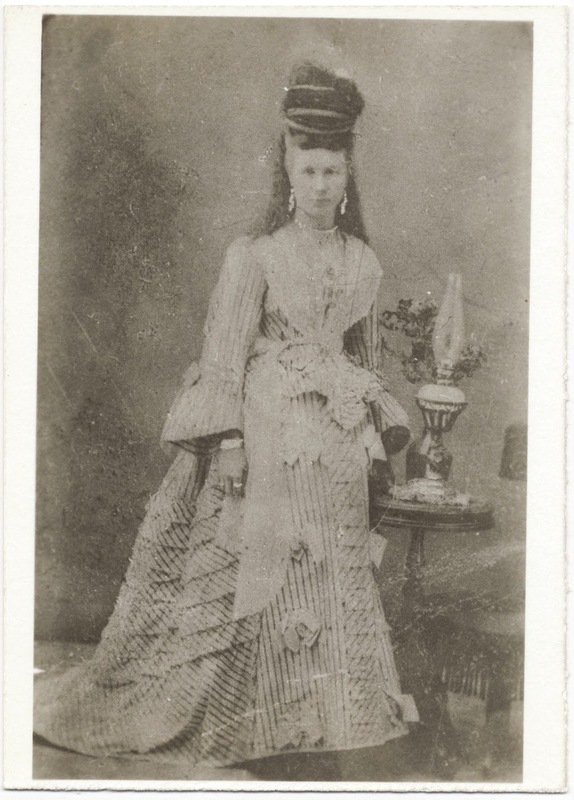 What if I confined my changes to removing the scratches on the image of the dress? Depending on the amount of time I wanted to spend, I could "fix" all the defects in the image. Here is a very interesting in-depth discussion of some of the legal issues involved in altering photos. Parry, Zachariah B., Digital Manipulation and Photographic Evidence: Defrauding the Courts One Thousand Words at a Time, Journal of Law, Technology and Policy, Vol. 2009, p. 175. Altering historical photographs cuts us loose from reality. Granted any photo is a representation of "reality" at the time the image was made, but once made, the image, in a sense, becomes the only observable form of that incipient reality. We can justify all sorts of changes to the "original" for a whole list of reasons, but the don't we have an overriding interest in having available the most authentic, unchanged historical evidence possible? That is my ultimate question and unfortunately, I have no easy or comprehensive answer. Where do you stash your genealogy stuff?